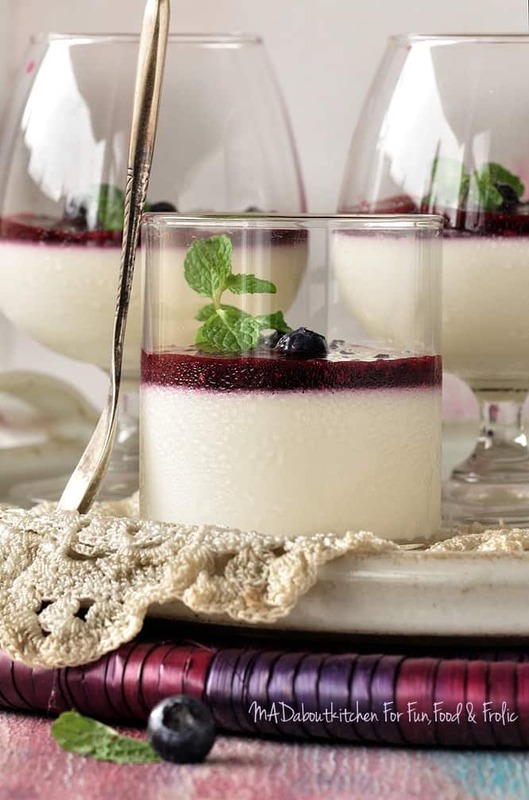 Vanilla Panna Cotta Recipe with Berry Compote is an Italian classic, and simple to make at home dessert for any celebratory occasion. Panna Cotta is a fuss free dessert to make and absolutely delightful in taste. The mouth melting texture of Panna Cotta rarely fails to please taste buds of dessert lovers. Panna Cotta can be infused with variety of flavours and tastes wonderful with ripe fresh fruits and berries. Madhuri is an accessory designer, an artist, a mother of a toddler and someone who loves cooking, trying her hand on blogging as well. Cooking for Madhuri is no different from painting or designing a lamp. She immerses herself one hundred percent in whatever dish she prepares for her family. From collecting ingredients to cooking, plating and later framing her dishes, Madhuri seeks perfection in all. Her each image is like a canvas of a talented painter, depicting shades of her creativity. The blog MADaboutkitchen is the artistic vent out of Madhuri’s inspired ideas. Take 1 tbsp of water in a small bowl and sprinkle 1/2 tbsp gelatin over it. Set it aside for 5 minutes to bloom. In a saucepan, heat milk and cream together over low heat. Just heat the milk do not boil it. Add sugar and vanilla extract to the simmering milk and stir till the sugar dissolves. To this add the bloomed gelatin. Keep stirring to dissolve the gelatin. Make sure no lumps of gelatine remain in the milk. Turn off the heat. Sieve this liquid into a jug to remove any leftover particles of gelatin. Pour this mixture equally into the serving glasses. Let it sit on the counter top for 15 minutes to cool down and then keep it in the fridge overnight or at-least for 5 - 6 hours. To make the fresh berry compote, in a sauce pan add berries and sugar and heat it over a low flame. Cover the saucepan with a lid. The berries will start sweating and the sugar will start dissolving. Cook it till the berries are soft and have released all the juice. Using a hand blender, puree the berries to a coarse paste. Put this mixture back into the saucepan and boil till the compote thickens a little. Turn off the heat. 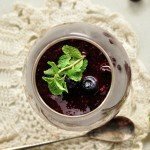 Cool the compote at room temperature and then store in the fridge. 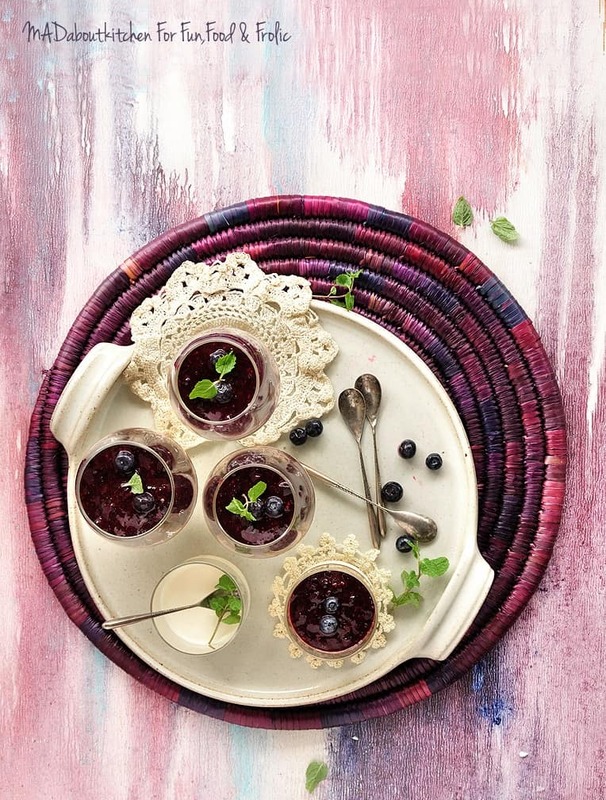 To serve the panna cotta, add a spoonful of berry compote over the set panna cotta. 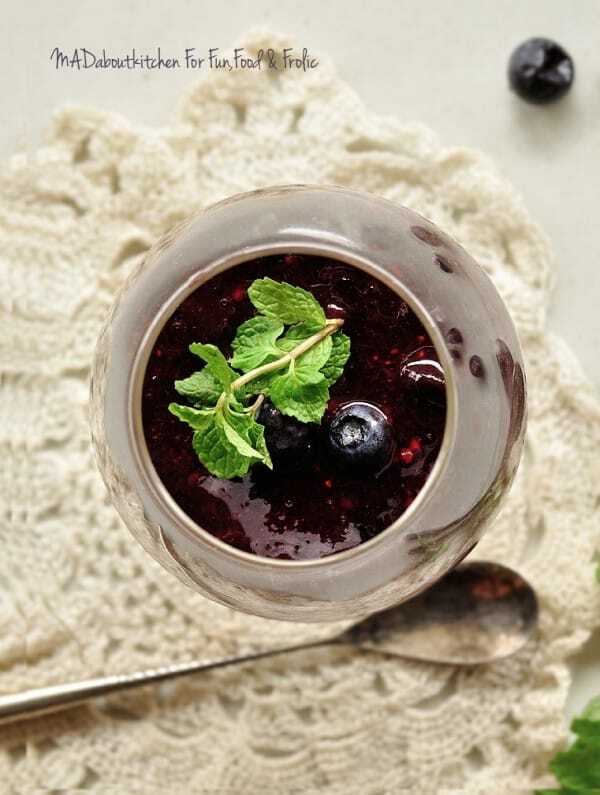 Garnish it with fresh berries and mint leaves. 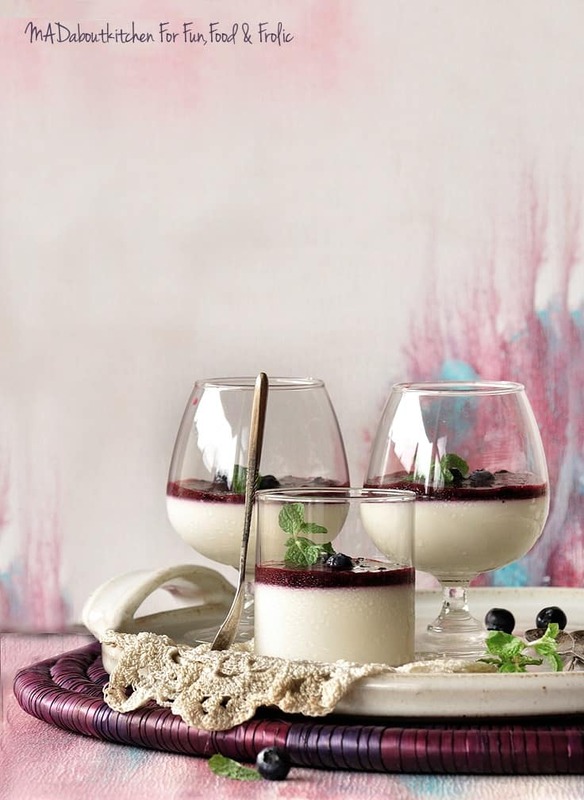 Serve Vanilla Panna Cotta with Berry Compote immediately. Always use cream and milk of similar fat %. If you are using heavy/double cream, then use full fat milk. And if you are using single cream then use semi skimmed or skimmed milk. If the fat % are different then you will see two seperate layers in the panna cotta. Wow!! Looks heavenly, I’m surely gonna try it since it’s pretty easy a recipe. Thank for sharing. Is there any alternative for gelatin? You can try china grass for a vegetarian version.